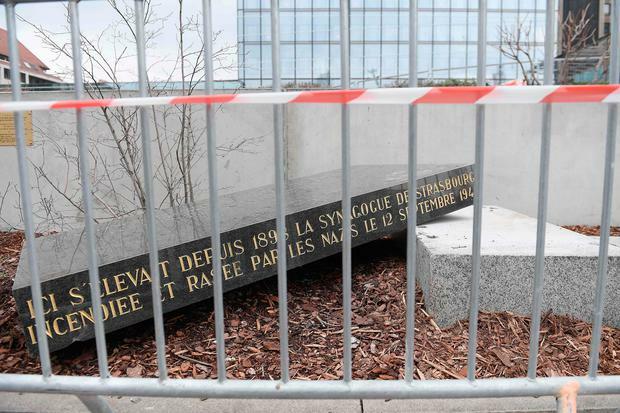 A memorial stone marking the site of a former synagogue destroyed by the Nazis has been vandalised in Strasbourg. Officials said the heavy memorial stone was discovered moved from its base on Saturday morning. Strasbourg mayor Roland Ries denounced the incident as “a new anti-Semitic act”. French officials in the region added that anti-Semitism “undermines the values of the Republic”. The monument commemorates a synagogue built in 1898 that was set on fire and razed to the ground by the Nazis in 1940. The incident comes amid an uptick in anti-Semitic acts in France in recent months. Last month, about 80 gravestones were spray-painted with swastikas in a Jewish cemetery close to Strasbourg.